The Lamb and Flag Let us not beat around the bush. This is a very very good pub. Every now and again I struggle with Fullers pubs as they can stray into the realms of TV bars with one too many big screens being gorped at by colour coded gangs of men. 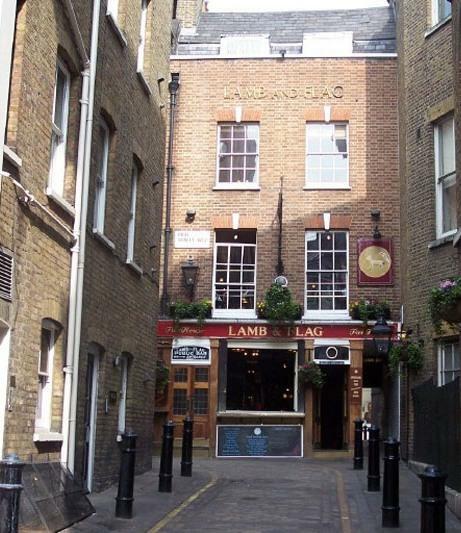 Lamb and Flag is a Fullers pub which has escaped this trend and remains an exceptionally good example of real London pubness. Over a pint carefully selected from amongst a selection of eight real ales my companion and I discussed the strange paradox which is how this pub remains so gloriously unchanged and original in such a commercial area of central London. If you look along the streets in the immediate vicinity you’ll find faux chalk board menus, flat pack furniture and condiments on the table in the majority of places. These other pubs sold out and lost their soul yet are the ones which teem with tourists wanting to see a British boozer after wearing themselves out buying tiny models of Big Ben. Lamb and Flag is where they ought to be to see a proper pub and yet it seemingly it’s overlooked. Not that I’m complaining. Being tucked up a side street makes this a little challenging to find and you’d easily miss it if you weren’t looking. Sadly this also makes it a fairly poor choice for summer drinking as it doesn’t get a lot of sun. Visiting on a slightly hazy evening seemed to be about right and we were able to sit in the bar near the vast open window to enjoy our beers. Tobacco stained wood covers most of the walls and the rest of the decor is accentuated with well polished brass keeping with the theme that this is a relic of a pub with its roots well in London’s past. These surroundings are very satisfying and the upstairs bar though small is no less enjoyable in a quaint sort of way. It’s not likely that Lamb and Flag has changed much over the past century and I for one hope that it doesn’t. Returned verdict? A hidden gem. This pub clings stoically to everything that other ought to and is better for it. If you have friends visiting London and they want to see a ‘proper pub’ then this is the place to take them if you’re in Covent Garden or Trafalgar Square and lets face it they’ll want to go there to see the living statues and ever so entertaining street magicians. I absolutely love the Lamb and Flag. It is a gorgeous gem surviving proudly in a sea of sameness. I had my birthday party there last year and they really pulled out all the stops for me. Great for Sunday lunch as well and when you want to show off the fact that you know London’s hidden treasures. Will have to check out the Sunday lunches. Loving the phrase ‘sea of sameness’ too.